10 June, a small asteroid left Earth’s orbit to pursue its solitary course around the Sun. A unique opportunity to learn more about these unusual miniature moons, also known as co-orbitals. What is a co-orbital asteroid? While some celestial bodies may one day pose a threat to Earth, others pause harmlessly to orbit the planet on their way around the Sun. These are called co-orbital asteroids, which means simply that they roughly track Earth’s orbit around the Sun. Asteroids regularly stay in the vicinity of Earth. They then “corkscrew” around the planet without really going into a true orbit, rather like a buoy bobbing in the wake of a boat’s propeller. They can remain in this unstable state for years or even centuries, until they dip close enough to Earth to gain the acceleration required to free themselves from its gravity. This is exactly what happened on 10 June, when 2003 YN 107—an asteroid barely 20 m across corkscrewing around Earth since 1999—left to continue its journey alone. The number of asteroids likely to visit Earth in this way can be counted on the fingers of one hand. But programmes conducting a systematic search for potentially dangerous Earth-crossing asteroids will undoubtedly turn up more in the years ahead. 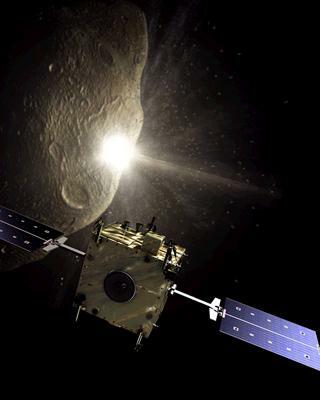 Such near-Earth asteroids could prove good targets for future exploration missions. Although we are now detecting huge numbers of asteroids, we still know very little about them. If an asteroid was found to be on a collision course with Earth, knowing more about its texture and density would help us to devise a plan to counter the threat: a racket is fine for hitting a tennis ball, but a steel ball would punch right through it. The European Space Agency is currently studying the Don Quijote mission with just this aim in mind. The idea is to launch a probe to intercept an asteroid, to land seismometers on its surface and then to fire an impactor into it and measure how it sustains the impact. We will then know how much energy would be needed to deflect it from its course—one further illustration of the vital role of space missions in protecting our planet and populations.